Stock photo of power plant in the City of Mnchen (Munich) with the Bavarian Alps in the background, Bavaria, Germany, Europe. Power plant in City of Mnchen (Munich) with Bavarian Alps in background of Bavaria, Germany. 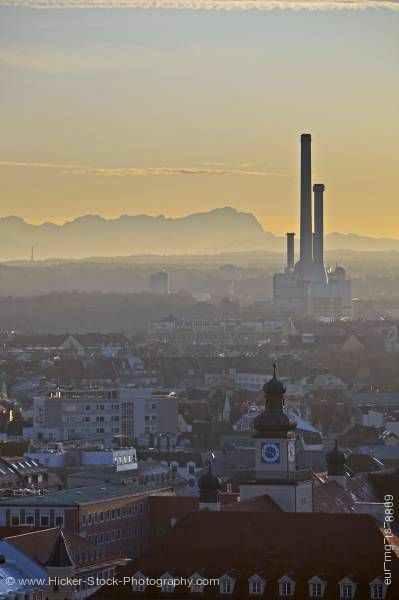 This stock photo shows the tall power plant in the background of the City of Mnchen (Munich) with the Bavarian Alps in the background, Bavaria, Germany, Europe. A heavy mist hangs on the horizon of the city of Munich reveals the power plant in the backdrop. The power plant seems to stand out of place among the classic charm of the city of Munich. Three long smoke stacks of varying heights stand tall on top of the power plant building. The power plant’s stacks seem to touch the light blue sky. The haze lingers over the city of Munich and a dark silhouette of the Bavarian Alps linger in the distant background. A clock tower with a unique style dome of the red peaked rooftop and gabled windows sits in the foreground and many buildings fill the city’s landscape. Power plant in the City of Mnchen (Munich) with the Bavarian Alps in the background, Bavaria, Germany, Europe.